3 bedroom, Sleeps 10. Close to everything!! 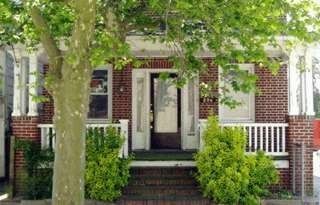 'A Piece of History in the Wildwoods'...This beautiful brick house is just 2 blocks from all the action of the beach and boards in Wildwood, NJ. The ground floor unit features three bedrooms: the first bedroom has a full sized bed, the second has two double beds, the third has a double bed and a set of bunk beds. The spacious living room with large comfy sofa..dining room has room for 8+. Also in your unit are a full bathroom, and a kitchen, which is fully outfitted with dishes, cookware, and utensils. You also have access to the airy front porch. Additional areas of the unit include a second half bathroom, laundry room with a washer and dryer; and a backyard with a picnic table and gas grill. Other features of the air-conditioned unit are dish TV; toaster and coffee maker, a microwave and oven. ..and finally WIFI! Look no further!! : Enjoy comfort and space in a beautiful, unique, historic building. Need even more room? Email us to see if both apartments are available for the week you are interested in. Booking now for late Summer, and Fall 2017! ..and of course Spring 2018! E-mail for even more photos! 1 queen, 3 doubles, two bunk beds, 1 sleep sofa. Porch with swing, DVD player. The unit we stayed in comfortably fit 8 adults. The spacious front porch made the trip. The owner was great, would definitely stay there again! Nice house, good spot for family vacation! We had good family vacation at this location, when we arrived the house has everything set with the the air conditioning already running and the backyard with gas grill ready to cook! This house is close to everything, chinese, italian,subway restaurants next street! and short walk to the beach/boardwalk! Neil and Rick were very responsive for any request, special thanks to Neil for the smooth renting process. I would rent this property again in future! Best part about the house was the owners. They were so friendly and helpful. The house was on the small side, but we were there for the beach, not the house. We booked last minute and weren't expecting that much. I would consider it a 2 and a 1/2 bedroom as the first one when you walk in, is not much of a "room". Either way mattresses were comfortable outside patio was nice to sit out on and shower was hot. Would definitely go back and stay in the bottom unit again. Close to beach access although it is a walk. It's a typical shore house, but had service with a smile. Thanks! Stayed with a few friends and it was a great getaway. 2 Blocks from the Boardwalk and it lands you dead center in the middle of it so you don't have a mile hike from one end to the other. Owners were very accommodating and always available for any questions. Highly Recommend. Great house to stay in!! This was a great place to stay in Wildwood. Very clean, nice big rooms, great kitchen, nice big front porch, safe area close walk to the beach. There were many stores and places to eat in the area, and plenty of things to do close by. Airconditioning worked great and bed were comfortable. We would stay there again! A fun family destination on the famous Jersey shore, the 2-mile boardwalk is filled with great food and activities for all ages. Enjoy miles of beautiful Jersey shore, some of the greatest beaches in the country. Minutes walk from Morey's Pier with their landmark ferris wheel and many more amusements; the fun shopping and 'doo-wop' district. Other nearby attractions are: the Wildwood Historical Museum, restaurants, and many antique and boutique shops. Recreational activities in the area include tennis courts, boating and fishing, and miniature golf. Wildwood is also just a short drive to beautiful Cape May, with its historic architecture, exquisite cuisine, and wonderful shopping. Another day trip is Atlantic City, just a short drive away up the Garden State Parkway. Full week rental required during summer season. Shorter stays considered one month prior to requested date.